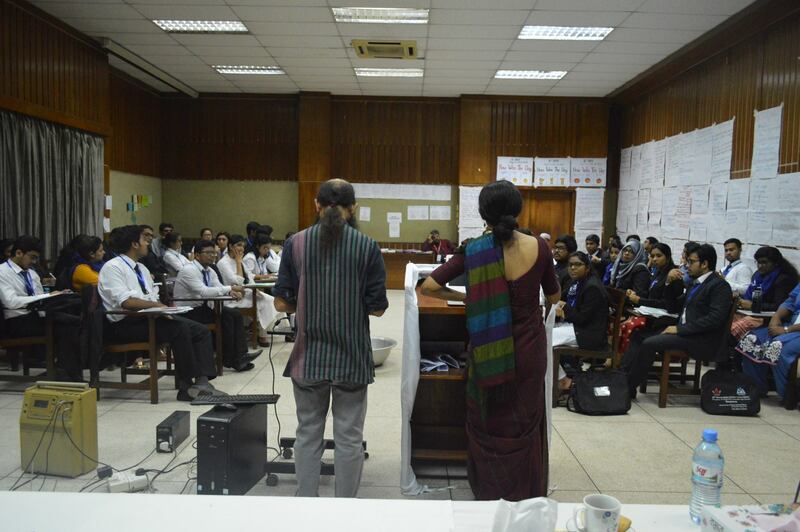 On 1 October 2017, the International Crimes Strategy Forum (ICSF), in partnership with Komola Collective, conducted an exclusive session on ‘Addressing Sexual Violence of 1971 Liberation War of Bangladesh’ at the 18th Human Rights Summer School (HRSS) organized by the Empowerment through Law of the Common People (ELCOP). This years’ HRSS has the theme of “Human Rights and Women” and is being held from 27 September to 7 October at the Proshika HRDC at Koitta, Manikganj. As part of their cluster presentation, ICSF screened their mini-documentary on the 1971 Bangladesh Genocide titled ‘Creed for Justice’. This was followed by a rendition of ‘Spoken Word Performance’ of the play ‘Birangona Women of War’ by Leesa Gazi from the Komola Collective. Two papers were also presented by ICSF members, Rasheda Khan and Barrister Tapas Kanti Baul, on the following topics respectively: ‘Adoption of abortion law/MR policy in Bangladesh in the wake of 1971 genocide’ and ‘How ICT-BD handled sexual violence of 1971’. The presentations were followed by a question and answer session with the attendees of this year’s HRSS, many of whom have come from abroad. The entire session was moderated by ICSF member Nabeel Ashraf Ali, who also gave the opening speech and closing summation on behalf of the organization. Apart from the cluster presentation, ICSF and Komola Collective have also jointly arranged a poster exhibition on the theme of sexual violence perpetrated during the 1971 Liberation War on Bengal women by Pakistani Army and their local collaborators. The exhibition generated immense interests among the young participants of the Summer School. International Crimes Strategy Forum (ICSF) is an independent global network of experts, justice advocates and organisations committed to end impunity for international crimes, ensure justice for victims of these crimes, and uphold rule of law and human rights. Komola Collective is a London-based theatre and arts company dedicated to telling the stories that often go untold – stories from women’s perspectives. ‘Birangona: Women of War’ is one of their signature projects, a one-act play about the untold true stories from among the 200,000 women who were raped and tortured during the Bangladesh Liberation War.